Chinese researchers solve the complete DNA sequence of the pernicious pest, revealing some of its evolutionary secrets. (Inside Science) -- On the fringes of urban life, some creatures thrive more than others. The brown rat, the coyote, the Canada goose, the Northern raccoon and many other species have all expanded their ranges and populations because they are well-adapted to scavenge or hunt in the shadows of human civilization. But perhaps none have been as successful as the cockroach. Many people perceive something unseemly about cockroaches -- their flat forms, their long twitchy antennae, their fondness for filth, their culpability in triggering asthma attacks and spreading infectious diseases, and their propensity to scatter when you turn on the kitchen light. But there's also something remarkably impressive about their ability to survive. The common American cockroach can resist pathogens and pesticides, avoid toxins, and thrive in filthy conditions. They can regenerate their limbs. They have extremely long lifespans in insect terms, living up to 700 days. They give birth to many offspring, and they colonize kitchens the world over, successfully cohabiting with humans who often want nothing more than to crush them. Now a group of researchers in China has solved the complete DNA genome of the American cockroach Periplaneta americana. Their analysis has shed light on some of the cockroach’s secrets of evolutionary success -- secrets that lie in its enormous genome and its hugely expanded set of specialized genes for immunity, chemical sensing and detoxification. "We found substantial expansion of gene families [that are] potentially related to these processes," co-author Shuai Zhan of the Key Laboratory of Insect Developmental and Evolutionary Biology at the Chinese Academy of Sciences in Shanghai wrote in an email to Inside Science. The American cockroach is originally a native of Africa and was introduced into the New World in the 1500s. Scientists have pondered how it so successfully spread from warm, wet environments to varied climates all over the globe. It turns out that the American cockroach has more DNA than almost any other insect, second only to the migratory locust. At 3.3 billion DNA bases long, their genome is comparable in size to the human genome. But the real secret of cockroach success seems to lie in the expanded clusters of genes that govern certain specialized physiologies. Cockroaches, like many insects, have a variety of "chemoreception" proteins that allow them to sense what's around them. Termites, which are closely related to the American cockroach, have many of the same proteins, and in their case the proteins help them to tell friend from foe and lowly worker from queen of the nest based on chemical signatures. But in the American cockroach these chemical sensors seem to play a key role in the insects’ ability to sense food and distinguish what can be eaten from what cannot. American cockroaches have 154 different olfactory or “smell” receptor genes, twice as many as other species of cockroaches and termites. They also have 522 gustatory, or taste, receptors -- far more than has ever been seen in any other insect -- allowing them to discriminate foods and avoid anything that is toxic. "The expansion of such gene families may increase the plasticity of their smelling and tasting to adapt [to] complicated environments," Zhan said in an email to Inside Science. As super tasters of the insect world, cockroaches enjoy an almost ubiquitous smorgasbord of foodstuffs. According to the World Health Organization, they sip milk, nibble cheese, eat meat, love chocolate and show a preference for sugars and starch. But they also eat cardboard, books, shoe soles, their own cast-off skins, dead and dying roaches and the fingernails of sleeping babies. The new genome also shows that the American cockroach has a proliferation of enzymes known as P450s, which help to degrade complex organic molecules. The German cockroach, another widespread pest whose genome was also solved earlier this year, has a large number of these enzymes as well. "Apparently this is useful for both species for coping with pesticides," said Erich Bornberg-Bauer, a professor at the University of Muenster in Germany. He was a leader of the team that solved the German cockroach genome but was not involved in the new research on the American cockroach. Another feature of the American cockroach is its ability to resist disease. The new genome reveals that the American cockroach has a greatly expanded set of so-called Toll genes, conferring on it a powerful innate immunity and the ability to synthesize and secrete a variety of antimicrobial peptide molecules. That doesn't stop the American cockroach from spreading illness and infection themselves -- things like diarrhea, dysentery, typhoid fever and cholera, according to the World Health Organization. Nevertheless, understanding the genome of the American cockroach and its cousin the German cockroach may help to suggest new ways to control the pests. "It's better to have two cockroach genomes than one, and we will go on comparing them," said Bornberg-Bauer. 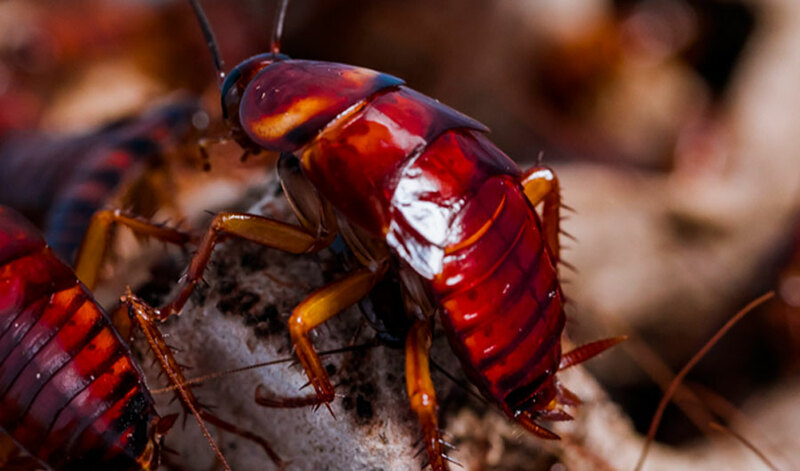 The same Toll genes that protect the American cockroaches against disease may play a role in the roach's longevity, and they are also implicated in its ability to regenerate broken-off limbs. This regenerative ability of the roach may help to explain the mechanism of a more than 2,000-year-old traditional Chinese medicine made from cockroach extracts. Current formulations are sold under the name "Kang Fu Xin Ye," and administered as a drug for wound healing and tissue repair. The new work may help shed light on how the drug works and may lead to new medicines, according to Zhan. "The genome analysis and functional genome analysis will help us understand the mechanism of the remarkable abilities of vitality and regeneration in the American cockroach," Zhan wrote in an email to Inside Science. Jason Socrates Bardi is the News Director of the American Institute of Physics and a longtime science writer.